About an hour ago I offended the Kennett Brothers. It wasn't intentional and I have apologised... But in my offending I learned a couple of things about Makara that I've conveniently forgotten over the last 15 or so years. You see, I was going to title this post "Makara Peak gets first digger built track" but it seems that it already had one, Magic Carpet, which was built with a Bobcat by Grange Gordon back in the day. Other trails have had sections built by diggers over the life of the park as well, but since the park's inception, budget and the sheer difficulty of building with a digger in the rocky terrain has been a barrier. So what's changed? Well for the first time ever we get to be thankful of someone with a NIMBY philosophy. You see, on the other side of the Makara Hill Rd, Karori Park was set to get an awesome Grade 2 track. A local got pretty vocal and opposed; they didn't want this happening in their backyard and the project got shelved. Although after talking with the Wellington City Council Senior Park Ranger Steven Peters, it hasn't been shelved permanently and will be back after a bit more public consultation. In the meantime though, the already approved budget moved across the road to the predominantly volunteer-built trails at Makara Peak. Simon Kennett of the Makara Peak Supporters and the Wellington City Council decided that the grade 3 "flow" trail that was already in the pipeline for the Peak should be fast-tracked and tenders were asked for. 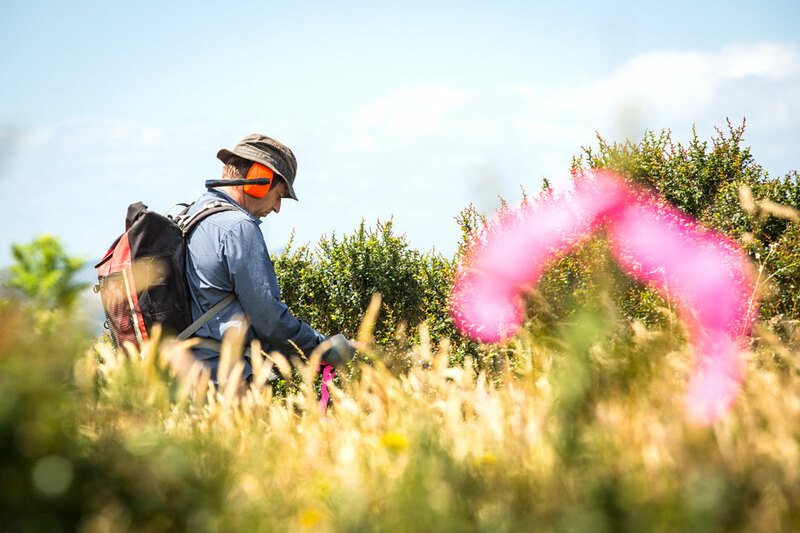 Southstar Trails began work yesterday marking the the new route which will run down the hill in between Ridgeline (the jewel in Makara Peak's crown) and the Snake Charmer 4WD track joining at the Three Brothers track. Full of rollers, berms and the occasional table, the track will be a tiny bit of a shift for what's currently on offer at the Peak, but there is no doubt it will provide a very attractive way down from the summit. Simon had this to say about Peak Flow: "The idea for Peak Flow popped into my head when I was analysing Ricky Pincott from Mud Cycles' idea for an easy climb on that slope. Once I'd drawn it out and worked out the length and gradient, it looked too long to build by hand (compared with a shorter option above Missing Link) but it looked like it might make a fine grade three downhill track. A flow track is what we're missing, and should be relatively easy to maintain (compared with North Face which we'll now happily let slip to grade 4). Because most of the vege is barberry scrub, I'm happy to see it built with a small digger. Obviously Southstar are real pros, so we're expecting this to be the most popular track in the park. Can't wait to ride it!" Jeff Carter and the Southstar Trails team kick off with the diggers on Monday. Jeff thinks the trail will be finished by the middle of February but we think it might take him a little longer once he discovers the "punk rock" that Makara Peak is made of, so the first person that picks the correct finish date will win something from out back here at Spoke HQ.